It seems that Facebook is jumping on the bandwagon of showing review stars in ads. 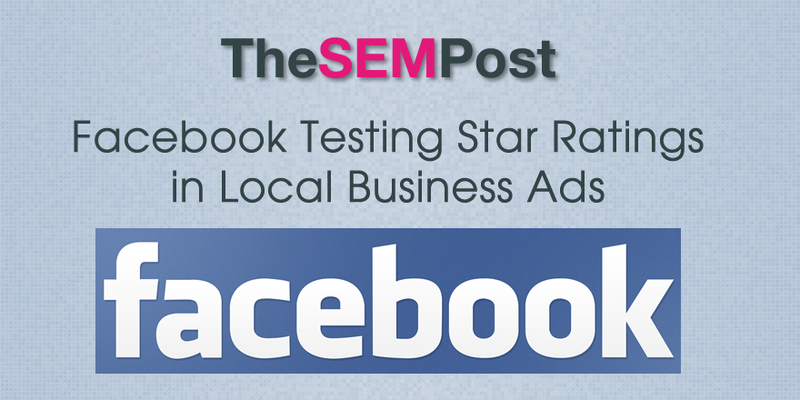 Facebook is starting a small test where they will show review stars in a small percentage of selected ads. Facebook is running it as a two month test but advertisers are able to opt-out of the test if they choose. Phillip Barnhard shared the letter he received from Facebook about the experiment. We are pleased to announce that your page TEST has been chosen to participate in an upcoming beta test for business ratings in ads. We are testing to determine if showing business ratings increases conversions from ads. From April 24 to June 24, 2017, star ratings from TEST reviews and ratings section will appear below your business’s name in a small percentage of your ads appearing in Newsfeed. Star ratings will only appear when the average star rating is 4 stars or higher and when there are at least 5 reviews. If you are not interested in participating, you can opt out in your Page Settings. You can manage your participation in this beta test at any time by editing the “Star Rating Experiment” setting. The setting is only available on the Facebook desktop website; it is not available on Facebook mobile applications. Thank you for your business with Facebook. It is no secret to advertisers (and those in organic search) that having a high star rating greatly improves clickthrough rate. So it isn’t surprising that Facebook is testing rating/review stars as well. I did check Facebook and did not currently see any ads running that are targeting me. However, I suspect it won’t take long for these ads to show more broadly and for more advertisers if the initial tests do show an increased CTR.